When you think of extreme weather in Edmonton, most people tend to think of freezing cold winters and epic blizzards. However, Edmonton summers are no stranger to extreme weather either. Torrential downpours, tornadoes, hail, extreme heat, and excessive winds are just some of the weather conditions the city experiences every summer, each of which impacts your vehicle and driving habits. We receive plenty of tips on how to handle winter roads and cold weather, but somehow summer seems to go unmentioned. Fear not! We’ve compiled a helpful guide to keeping both you and your vehicle safe when dealing with a number of different summer storm conditions! Is it really summer in Alberta without at least one major rainstorm? It seems that almost every summer we’re met with a storm that temporarily floods streets and turns underpasses into lakes. While a little rain is a good thing, when it starts coming down in sheets it can cause some major problems for vehicle owners if they don’t take the proper precautions. When the rain starts coming down, be wary of where you park your vehicle. Heavy rain can cause creeks, streams, storm ponds, and the like to overflow into the streets. It’s also important to remember that water runs and pools on lower ground. Park your vehicle on higher ground if at all possible. 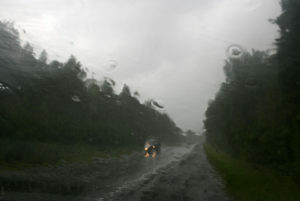 At the very least, avoid parking in dips in the road when the rain starts coming down. The last thing you want is to deal with water damage, whether it brings mechanical issues or it’s only cosmetic. As drivers, most of us tend to become overconfident in our abilities to take on extreme weather. One example is when we choose to drive through massive puddles during or after a major rainfall. The biggest issue is that there’s really no way of knowing how deep that puddle is unless you are quite familiar with that particular road. This is especially true in extreme situations where underpasses and even main roads become flooded. Flood water can actually stall your vehicle and cause some serious damage! When in doubt, wait for the water to recede or take an alternate route. Edmonton has had some notable hail storms in the past. At least every few years, golf ball-sized hail will come down in the Capital region. Hail that size can do some serious damage to your vehicle, from paint chips and small dings to broken windshields and large dents. If you have a garage or access to covered parking make sure you use it! The easiest way to prevent hail damage is by not exposing your vehicle to hail. It may be the “easiest” solution, but of course this isn’t an option for everyone. A portable carport may work for those don’t have a garage but still park on their own property. If you know hail is coming and find yourself far away from home, consider taking a trip to your local mall. Most malls have some sort of covered or underground parking, which offers some protection from the elements. Parkades in the city center off the same type of protection, but of course these are a pricier option. Maybe you don’t have covered parking, or you’ve found yourself caught somewhere mid-storm. In this case, there are still some precautions you can take to minimize damage. First of all, if you are regularly without sheltered parking, it could be beneficial to invest in a car cover. They are easy enough to find and there are even covers that are designed to specifically to prevent hail damage. If you don’t have a car cover, the next best thing is to dig out those blankets and comforters to create a layer of padding. Secure them to your vehicle with some rope or duct tape so that they aren’t blown away, and you have a makeshift car cover. In a pinch, placing your vehicle’s floor mats over the windshield can help to dampen the hail’s impact and lessen potential damage. While they may not cover as much area as a blanket would, it’s a great option if you have nothing else. While Edmonton isn’t known for being particularly windy, it’s not uncommon for large gusts to accompany storms. With them comes the potential for vehicle accidents and some serious damage. While your first instinct in a storm may be to take cover, it’s important to really evaluate where you choose to do so. At first glance you may think parking underneath a tree is a good idea. Talk to any experienced driver and they’ll let you know that this is a rookie mistake. Unfortunately, trees have a tendency to lose branches or even fall over, especially the beautiful large trees found in mature neighborhoods. The better option is to park your vehicle near a large building that can help block out some of the elements. When the wind picks up, it’s important to be aware of your surroundings and any potential hazards that could cause damage to your vehicle. Loose shingles on your home’s roof, unsecured garbage and recycling bins, and overgrown and overhanging tree branches are all potential hazards that should be properly dealt with. Not to sound like your driving instructor, but get those hands on the wheel at 9 and 3! Large gusts of wind can send your vehicle drifting out of your lane. Prevent any surprises by having a firm grip on the steering wheel and being prepared to make small corrections as needed. Note: be careful not to over correct, especially if you temporarily drive through a sheltered area. The key with any extreme weather is to stay alert. Pay attention to changing weather conditions and take the appropriate action. Regardless of what mother nature throws at you, remember that there is no shame in taking a break and waiting for conditions to clear up. It’s the best way to ensure you and your vehicle stay safe in extreme weather. From paint chips to major body work, Freeway Auto Body has you covered! Contact our team today to learn more about how we can help with your maintenance and repair needs.